ONE: In a heat safe container, add white beeswax and argan oil. 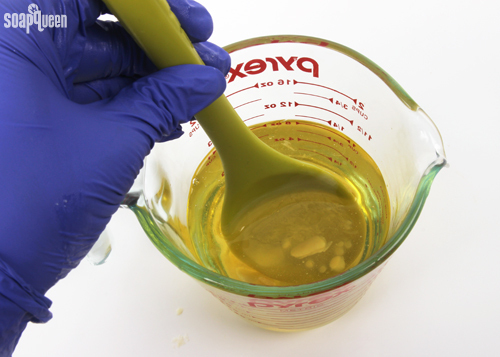 Beeswax has an high melting point, so adding a liquid oil helps the wax to melt easier. 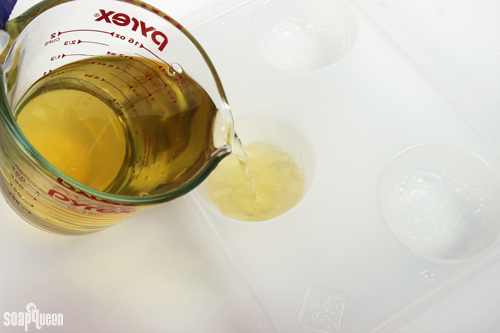 Place container in the microwave and melt wax using 1 minute bursts, stirring between each burst. TWO: Cut the mango and cocoa butter into small pieces and add to the hot oil mixture. Cutting the butters into small pieces before adding helps melt the butters easily. THREE: Stir butters until fully melted and incorporated. If necessary, place the container back into the microwave using 15 second bursts until the butters are thoroughly melted. FOUR: Once fully melted, add the avocado extract and stir to combine. 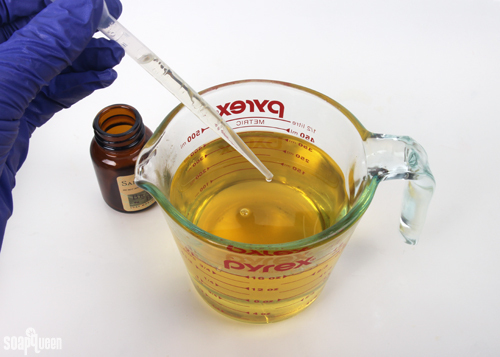 FIVE: Add the Sandalwood Vanilla Fragrance Oil, and stir to thoroughly combine. SIX: Slowly pour the mixture into each mold cavity. Be careful, the container may be hot! Allow the lotion bars to fully cool and harden. This may take several hours. Gently remove the bars and enjoy! When packaging these bars, make sure to wait until they are completely cool and hard. Saran wrap would work well as a packaging option, as well as a tin or jar. During the cold winter months, how do you keep your skin moisturized and comfortable? Sorry if this question was already asked. In your recipe, the FO quantity is about 3.5% of the total recipe. Is it a percentage I can stick to? I feel I always want to make more FO than in a regular liquid lotion, but I don’t want to irritated my customer’s skin. Same with EO, what would be a good percentage range (mini-max /safe limit) of FO and EO? 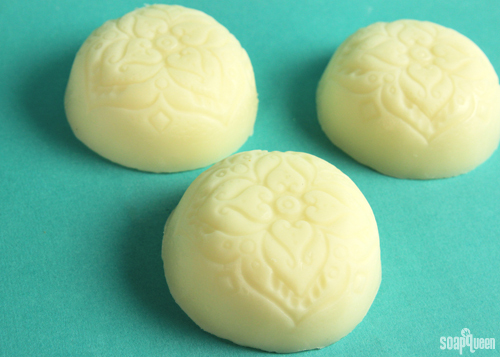 I am excited to make solid lotion bars and various other kinds of lotions. I have super dry hands from making ceramics so I go through a lot of lotion. 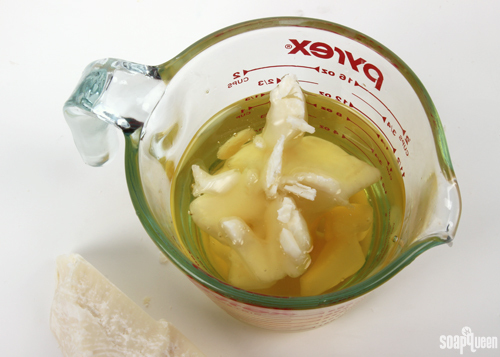 Do you have any recipes that use an alternative wax to beeswax? Could I simply use candelilla wax in this recipe, and if so, how much would I use? I would like to make this recipe and add aloe. Can you put Aloe Gel into this recipe instead of aloe extract? can I use cerabellina wax? i have a bit of avocado butter left over from makin avocado body butter.was wondering if i could mix the mango butter & the avocado butter together for the lotion bars or would that be a mistake? hi there.. just wondering if i can use something other than avocado extract? Is there a vegetable based wax that would work with lotion bars? hi,, does this recipe only make 3 bars & if so can it be doubled? hi there,,, i will be makin these next. after i make SQ avocado body butter which i hope is soon just waiting for my items to be delivered,,can’t wait! Is there any reason I couldnt use a silicone mold instead of the heavy duty mold? This can certainly be tricky. I think you might find the blog post, “Soaping in the Summer Heat,” helpful. It has a lot of tips on shipping products in the heat. Tips include using ice packs and thermo cases to keep them cool, and using 2-day shipping. You can check out our tips below. I hope this helps! Do you need preservatives in type of lotion bar. Hi, I am interested in making these lotions bars, only problem is I’d like to be able to gift to my mother but she’s allergic to anything mango. What other butters could I use instead in place of the mando and how much of it? I would recommend adding the shea butter at 3 ounces, the same amount as the mango butter. I looked at bramble berry for the Deodorized Cocoa Butter but it’s out of stock. Would the regular cocoa butter affect the smell too much of the finished bar? Do you have any suggestions of other fragrance oils that would compliment the cocoa butter scent? The cocoa butter would give the final product a chocolatey scent. I think that scent would smell awesome with the sweet and woodsy Sandalwood Vanilla Fragrance Oil! You could also add Dark Rich Chocolate Fragrance Oil to these bars to enhance the chocolatey scent. I love the feel of thee lotion bars but I am having a problem getting these to come out of the mold cleanly. It is leaving parts of the design in the mold. Any suggestions as to how I can fix this problem or do I need to use a different mold? I would like to make one that can be used during the summer without melting. Would I increase beeswax a bit. If so how much. Thanks. Also, keep in mind the mixture will be more firm, so it may be a bit more tricky for it to melt on contact with skin. 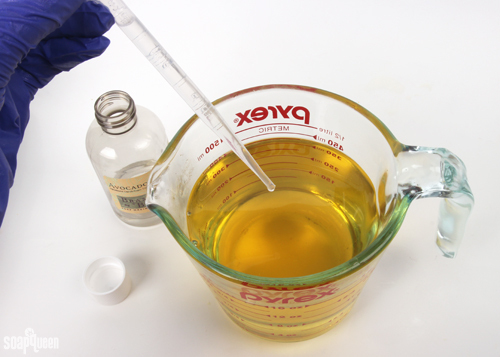 A small test batch would be helpful, that way you can test it on your skin and see what you think! I made these, and they work great, except that they have a slightly grainy feel, or perhaps it’s more like small lumps in the lotion when you rub the bar on your skin. If you keep rubbing it in, the lumps dissolve on your skin. I’m thinking that the wax or butters did not dissolve enough. Did I do something wrong or is that normal? Sometimes, mango and cocoa butter can get graininess if they get heated up too much or too quickly. 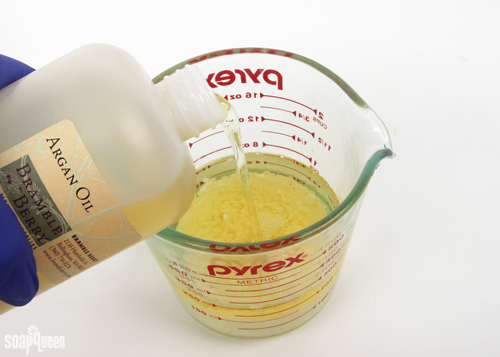 We recommend melting the oils and waxes together, then removing the container from the heat and stirring in the butters. That heats them gently and helps prevent the grainy feeling. Just following up – the recommendations from Kelsey were great! I did some experimental mini-batches (about 2 oz yield) of this recipe and the Lotion Bar Love. For this one I used sweet almond oil instead of argan oil and shea butter instead of mango butter. I hadn’t ordered any beeswax from BB, but luckily had a hunk of beeswax on hand (took me about 82793 years to grate up half of it lol). No fragrance or color for these experiments, and I totally forgot to do the frozen spoon trick – I even had a spoon in the freezer ready to go, dangit. But I like the delicate scent of the cocoa butter (and I think I smell the beeswax? It’s nice. ), and am waaaaay excited to play with my new orange peel cybilla FO and my sample of Marrakesh! Lotion Bar Love…turns out I understand why the original recipe is in a push tube. It’s a little soft to be out on its own, but I DO like it. I also skipped the green tea extract, but that’s only because I used it in some soap recently and I don’t want it in everything I own just now. For both of these recipes, I was wary of the beeswax content, and now I feel silly about that. I might even melt down both of the batches I made and add beeswax until they’re about 30% beeswax. Seriously though I have a little of this lotion bar on my hands right now and I can’t stop rubbing them together! This is the best my skin has felt in days – after I just got done saying I’m a fangirl of Lush’s Soft Coeur, I think I might like this even better. New question – Is it *at all* recommended to color this with a little cocoa powder? Like if I wanted to make some kind of swirl with these bars? Or will the cocoa powder feel gritty when you work through it? You can definitely use cocoa butter to color this recipe. I would recommend mixing it in with your fragrance oil or another liquid oil before adding it. That way it will incorporate nicely and not have any clumps of color. I’m gearing up to try out a small batch of this recipe (http://curious-soapmaker.com/soft-coeur-lush-massage-bar-recipe.html), based on one of my favorite things I’ve ever put on my skin. However! The recipe in the site I linked doesn’t use a wax of any kind. Am I signing up for a soft, oily mistake? How important is a wax for lotion/massage bars? 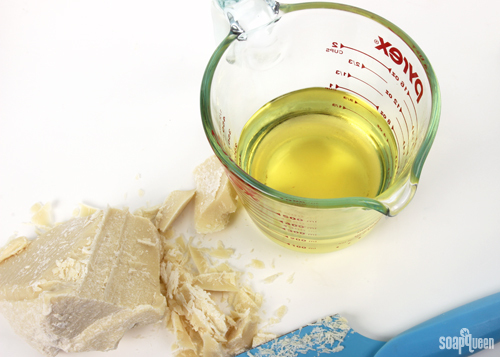 Including the recipe in this post, every lotion bar recipe I’ve found calls for beeswax, which makes me worry a little about the one I think I want to try. We haven’t tested the recipe in the link you provided, so I’m not 100% sure! It may help to email the recipe author to find out more. Thank you! The Lotion Bar Love recipe looks like a better one for me to start with. I read through a lot of the comments and noticed some people’s preferred proportions are influenced by their local climate. I currently live in the midwest where it’s VERY cold in the winter and pretty hot in the summer. This might be why the original LUSH Soft Coeur (a very soft bar, now that I’m thinking about it) is so great on my skin in the winter – haven’t had it in the summer yet but I can see how the softness of this bar might be troublesome in warmer weather. I may have to mess with making designated winter and summer bars, lol! Again, thanks for all the incredibly helpful advice. The Bramble Berry/Soap Queen support teams are champs! Hi, I see that Kelsey answered the question that yes Essential Oils can be used in this recipe but I dont see how much you would use in this particular recipe. I would like to use Essential Oil vs Fragrance Oil but Im not sure how much to use. What about using ecosoy wax?? It’s cosmetic grade, but wondering if it will result in a softer bar?? Opps or what about cera bellina wax also?? We didn’t test this recipe with either of these waxes, but I believe that would be OK! Is it possible to substitute argan oil with the other one? for example with almond oil or anything else? Jojoba oil and avocado oil would both make great substitutes. They are lightweight and moisturizing like argan oil. I just made these lotion bars. Very nice but on the soft side. How much more beeswax could I add? What about a little more cocoa butter and a little less liquid oil? I don’t want to end with rocks! To make these bars a little harder, you can decrease the argan oil and add more beeswax or cocoa butter. Can these be used in the bath too? Like a bath melt? We have a great recipe for Goat Milk Bath Tea you may like. 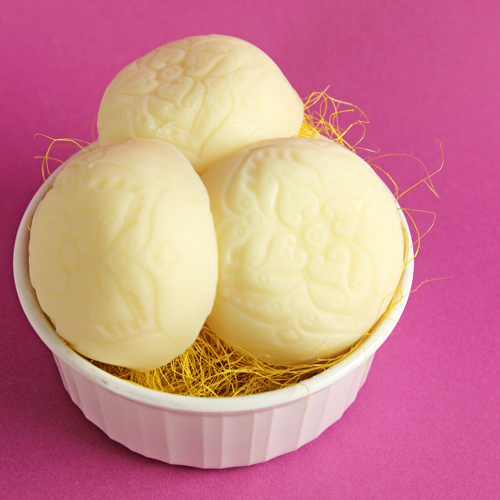 It melts beautifully in your bath and the goat milk and cocoa butter are very nourishing and moisturizing! I would like discussion on the different types of vanilla scent. Sandalwood vanilla you say is earthy. Which vanilla would I get if I just want a true vanilla scent? A great true vanilla scent is our Vanilla Select Fragrance Oil. It smells creamy and rich! I made them before using almond oil, Shea butter, cocoa butter, beeswax and lavender, rosemary and tea tree EO. I added just a bit of vanilla so it smells a bit sweeter and not just camphorous. I used those rose shaped silicone cupcake molds. I keep mine in ziplock baggie by my bed. Easily warms in my hands and rubs in the skin. Did this recipe make 3 bars like pictured or more? Thanks for sharing that recipe, it sounds awesome! I bet the vanilla smells amazing with the floral herby essential oil mix. I have never made a lotion bar but have heard a lot about them.. This sounds like a great Christmas hamper filler.. I would also like to know if essential oils will work well in these. Hi, I sell mine unscented since not everybody likes the same scent, but I do make them custom with scents as special orders. Lavender is great, but be careful with citrus since it’s a leave on product you would not want to use EO’s that are photosensitizers. I would also be careful with mint EO’s since if you customer had peppermint on their hands and rubs there eyes, it would really burn. I haven’t tried any spice EO’s before, but I imagine it would burn like peppermint if you got it on a mucus membrane. Lemongrass or Litsea Cubeba are great too. You can use essential oils in this recipe. Yay! Also, Heather has some awesome information (thanks Heather!) Citrus essential oils are photosensitizers, so you don’t want to use them in leave on products. Additionally, mint essential oils can cause a cooling or irritating feeling. On brambleberry.com, each essential oil will say if they can cause irritation in the product description. Since I live in a desert climate, I am constantly searching for treatments for dry skin. Lotion bars are the best remedy I’ve found for dry, chapped, and cracked skin. I rub the bar on the affected area (usually my legs or feet) until it melts, and then I rub it in until it’s absorbed. It’s like a bonus mini-massage! I’m so glad you like this recipe! Lotion bars sound like the perfect thing to have in a desert climate. Would this recipe work in a deodorant tube? Or would it need to be firmer? Could this be done using all essential oils? Which would you recommend? That’s good info Heather, thanks. You can definitely use essential oils! I’m making this tomorrow!!! whoo-hoo just in time for my fall shows!! Thank you so much Anne-Marie!! I don’t use them personally, but have heard that they work real well if used after a shower. Your skin is warner then and they melt easier. 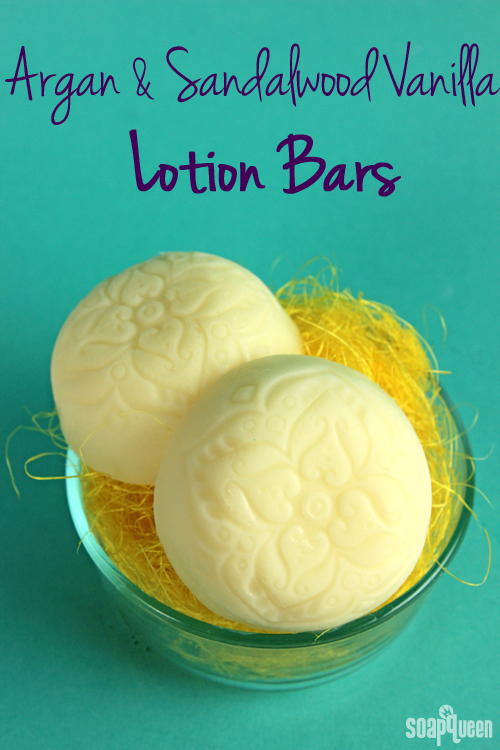 I make and sell lotion bars and am totally hooked on them! The way I explain it to my customers is to cup the lotion bar in your hands for a few seconds and rub them a little. The friction and your body heat will warm up the waxes/oils/butters enough so that you can take what rubbed off the bar and massage it into your skin. Recipes vary, and I’ve formulated mine to a nice balance of hardness and slickness. I sell mine in small tins. It’s definitely not a stupid question! I was unsure how they worked before I started working here. Also, they may not taste too great!